Coppicing is a woodland management technique used to produce a plentiful and manageable supply of young wood, timber or poles. The practice works because, when felled close to the ground leaving just the established root system and stump (know as a coppice stool), many varieties of tree will produce multiple, quick growing, shoots. Until fairly recent times all farms and smallholdings would have maintained an area of coppice, or copse as it is more traditionally spelt, for the essential raw materials they provided. Wood from the copse could be used for fuel, fodder and building and crafting materials but, more than this, it also provided an ever changing environment that was useful in maintaining the biodiversity of an area. Traditionally hazel and ash were popular as they produced quick growing material for fences, hurdles and firewood that would be harvested every five to 10 years. 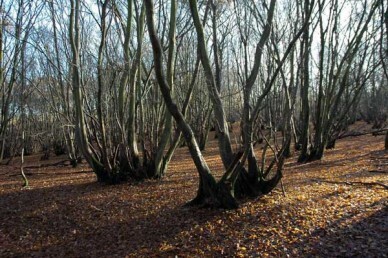 Depending on the final use, other popular varieties for coppicing (including hornbeam, willow, beech, lime and oak) would be harvested at different intervals of anything up to 25 years or, occasionally, more. 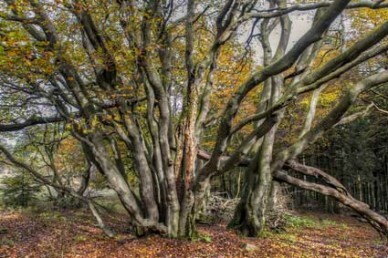 Large scale coppicing is now rare and the only commercial coppicing operation left in the country consists almost entirely of sweet chestnut which is used extensively in the fencing industry. Two major industries that were supported by coppicing originally were charcoal making – which was essential for metal smelting before coal became a more viable option – and thatching which relied on coppiced woods for spars (the pins for attaching thatch) and binding rods. While these industries have largely died out there are still several small-scale producers that maintain coppices for these purposes. There are several different ways of producing coppice all of which have environmental advantages. Pure and mixed coppice, as you may deduce, is where single or mixed varieties of trees are coppiced depending on the use of the final product required. ‘Coppicing with standards’ refers to coppice grown in the same area as full size trees – popular in olden times to achieve the widest range of timber from an area. This method requires careful spacing to avoid excessive shade forming over the coppice and stunting growth. Of course the easiest way to establish coppice is to fell existing trees but it is entirely possible to use transplants; however, this should be seen as a longer term project. Transplants should be allowed to establish for a minimum of 2 seasons before the initial cut although more is preferable. When transplanting take into consideration the variety of tree and the length of coppicing cycle. For instance where hazels are grown on a 4-7 year cycle you might site stools a minimum 2.5m apart where ash or oak to be cut at 25 year intervals may need upwards of 7m. 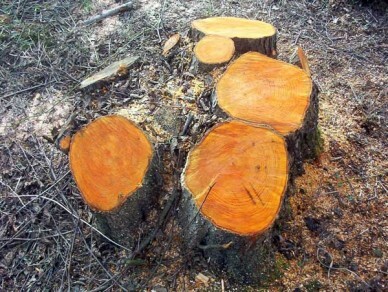 The initial felling cut should be made close to the ground and can be done at any time although, if trees are felled in late winter or early spring, don’t worry if there is no growth in the first season as many stools will lie dormant and then burst into life in the second. When they are off and running prolific varieties such as ash can produce canes at a rate of a metre or more per year. Areas of coppice are harvested on rotation so that there is always a crop ready for harvest each year. These distinct sections of woodland, each with growth at different ages, are know as ‘coups’. It’s a very efficient system as coppiced trees are constantly regenerating and will essentially live forever – some coppiced stools that have been managed for hundred of years reach 5-6 metres in diameter. FACT: coppiced wood is easily identifiable from the curved ends where it grows from the stool, enabling historians and archaeologists to track usage through the years. Cutting is an art in itself. The main consideration should be not to split the stem or bark which will allow ingress of water. Use the appropriate tool for the width of the pole as, while a sharp billhook is perfectly adequate for thin canes, you may be better advised to use a bow saw or a chainsaw for thicker ones. Cut very low down in the first year but subsequent cuts can be made anywhere up to a foot from the ground. TIP: Cutting/harvesting poles is best done in dormant winter months as new shoots tend to grow better and aren’t as likely to be affected by frost damage as those from a summer cut. This is particularly true for hazel. 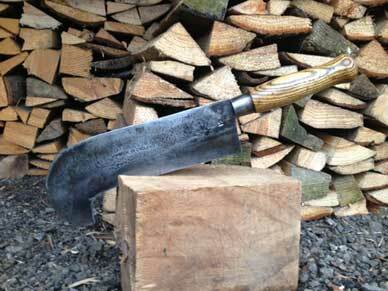 So what can you do with coppiced wood? The list is enormous. As mentioned earlier, traditional large scale uses included charcoal, firewood, building (wattle panels), hop canes and fencing. It is still used for these purposes today on a smaller scale as well as providing raw materials for thatching, furniture making and woven products such as baskets. Garden products such as pea sticks, bean poles, pergolas and gazebos as well as handcrafted walking sticks and horse racing jumps are all made from coppiced woods. The list is long and diverse. By far the most important aspect of coppice management is protection from grazing by deer, rabbits and livestock. 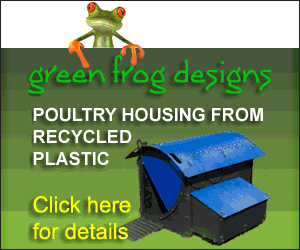 There are several methods you can employ but the most effective deterrent is still suitable fencing. However, this can be an expensive option and often brash is employed to cover sprouting stools or used to create a dead hedge barricade. Pollarding is similar to coppicing but is used to limit the height of the tree rather than felling it completely to encourage regrowth. Dense growth is encouraged by removing the outer branches. The regrowth is then atop a longer trunk, or billing, which is less prone to grazing and was often preferred to coppicing by livestock keepers. Now used almost entirely to control growth and reduce shade, pollarded trees would originally have been a source of both wood and forge for animals. If conservation is high on your list of priorities then an area of coppice could also tick this box. Managed woodland will provide the perfect environment for all manner of woodland plants, birds and animals, notably the shy dormouse which uses the foliage of coppiced hazel to move around unseen. It’s disappearance led to the serious decline of some of our rarest butterflies and insects but re-introduction in suitable areas can turn back the clock as was seen with the re-establishment of the Heath Fritillary butterfly in Essex where it had been extinct for over 20 years. 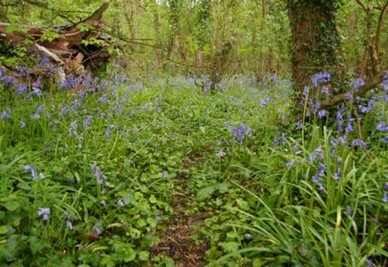 Woodland flowers such as the bluebell, primrose and wood anemone emerge early to make the most the light available when the leaf canopy is absent. Coppiced woodland supports these species but, at each cut there can also be a re-emergence of flowers whose seeds have lain dormant through lack of sunshine. If you have an area of unattended coppice that you decide to reinstate you may be lucky enough to find rarities such as meadow clary, lady orchid, and hairy mallow return to the newly opened areas even if they have not been present (above ground at least) for many years previously. So you can see an area of coppice, even these days, presents a very good argument for inclusion in plans for any smallholding and, within a relatively short space of time, could be providing extra income as well as increased biodiversity – one commodity that is becoming harder and harder to maintain.